I’ve been seeing pictures of grilled avocados and grilled guacamole all over the place lately and I’ve been dying to try it. Around here, we like to throw just abut anything on the grill, so I’m not sure why it took me so long to grill avocados, especially since we eat them at least a few times a week. When I realized that this week’s Summer Fest theme is corn, I knew I’d be making something with grilled corn. I love corn any which way, but I especially love the extra dimension of flavor the grill gives it. Since I’d already been dreaming of grilled avocados in guacamole, I decided I’d might as well add some grilled corn as well. And, well, our garden is producing more tomatoes and serrano chiles than we can eat right now, so of course I needed to add some of those, too. We’ve been receiving a couple ears of sweet corn each week in our CSA box, so even though I’m not able to pick it from my own garden this year, it’s pretty darn fresh and delicious! 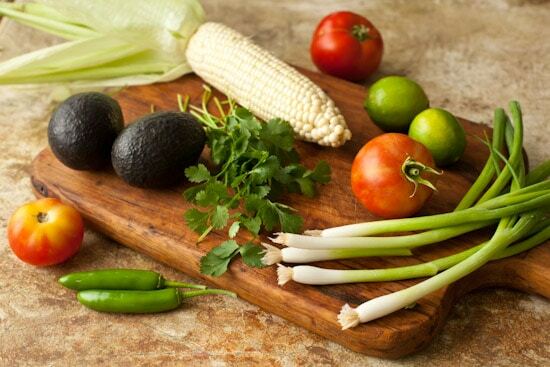 So here are the ingredients for this grilled corn guacamole recipe: Hass avocados, sweet corn, green onions, limes, tomatoes, and serrano chiles. As I was preparing things for the grill, I realized that since I was going to grill the avocado and corn, I could try grilling some of the other ingredients as well. So, I threw the chiles, onions, and limes on there, too! Everything took on some nice color, but I was careful not to overdo it and dry anything out. I wanted flavor, not charcoal, in my grilled guacamole! The only things I didn’t grill were the tomatoes and cilantro – I wanted the tomatoes to retain their meaty texture and bright color. 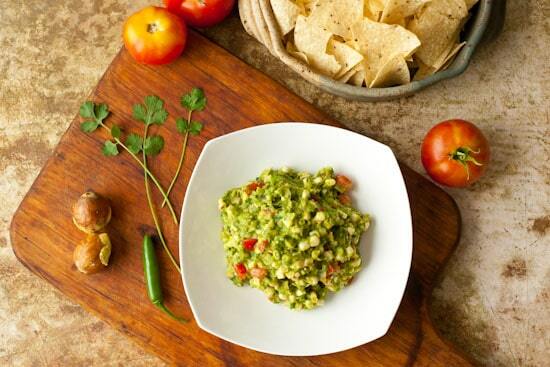 Now I know why grilled guacamole has become so popular – it’s delicious! Grilling the vegetables adds a mellow, smoky sweetness to this dip that is really incredible. While there will always be a place in my heart for my standard guacamole recipe, this one is definitely going into regular rotation! Preheat a gas or charcoal grill with cooking grate in place until it’s very hot (high heat, if using a gas grill). Meanwhile, halve the avocados and remove the pits; slice the limes in half. 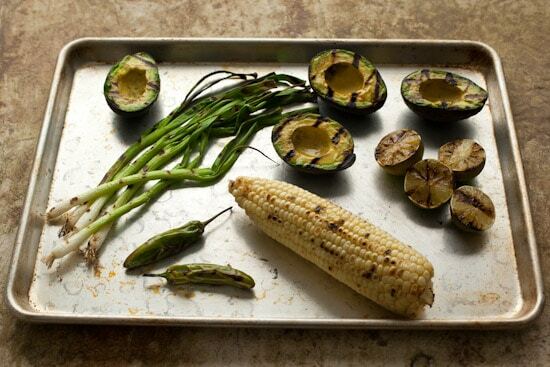 Gather the avocados, limes, corn, green onions, and chiles on a tray for easy transport to the grill and back. 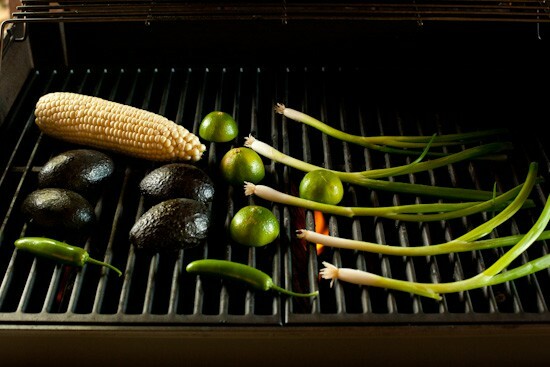 Once grill grates are nice and hot, put the avocados, limes, corn, and chiles on the grill – the avocados and limes should be cut-side down. Be careful with the chiles and onions because they fall through the grates easily. Remove the limes and avocados when they have grill marks and are starting to caramelize, but before they blacken too much. Turn the onions and chiles so that both sides get grill marks. Remove the onions once they are soft and have color on both sides but before they dry out too much. Remove the chiles when the skin is blistered all over. The corn will take the longest – turn it occasionally and cook until it has some color on all sides and the kernels are tender. Let everything cool enough to be handled. While the grilled vegetables are cooling, chop the tomato and mince a handful of cilantro. When cool enough to handle, scoop the flesh of the avocados into a medium bowl. Chop the green onions – the white part and the green part that isn’t too dried out – and put in the bowl. Remove the stems from the chiles, slice in half vertically, and remove most of the seeds (the seeds may be left in if you want a spicy guacamole – you decide.). Mince the chiles and put them in the bowl with the avocado and onions. Mash everything together in the bowl with a potato masher or whatever you have handy. Cut the kernels from the corn cob with a sharp knife and add them to the mashed avocado. Stir in the tomato, as much cilantro as you like, and the juice squeezed from two grilled lime halves (reserve the other two halves to adjust seasoning at the end). Add the salt and a bit of fresh ground black pepper and stir well. Taste the guacamole and add more lime juice and/or cilantro if you think it needs it (I used juice from both limes, but mine were pretty ripe and sweeter than normal). Serve immediately with your favorite corn chips or press plastic wrap to the surface and store in the refrigerator until party time. Recipe notes: *you may substitute jalapenos for serranos if that’s what you prefer. If you’re worried about heat, add only half the chopped, seeded chile at the beginning, then taste and adjust from there. I used two large, seeded serrano chiles and I would say the heat was about medium. This recipe can and should be doubled or tripled if you’re making it for a crowd. It goes fast! Have a recipe or tip that fits any of our weekly themes? You can contribute to our online recipe swap in various ways, big or small. Contribute a whole post, or a comment—whatever you wish. It’s meant to be fun, viral, fluid. No pressure, just delicious. Simply leave your tip or recipe or favorite links in the comments below a Summer Fest post on my blog, and then go visit my collaborators and do the same. 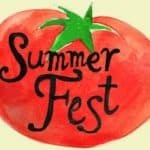 Or think bigger: Publish entire posts of your own, if you wish, and grab the juicy Summer Fest tomato badge (illustrated by Matt of Matt Bites). Grilling guacamole ingredients was brilliant! We especially love seeing the grill marks on those beautiful avocado. Oh Wow!! Awesome recipe..Thanks for sharing.. I really need to try grilling avocados! This guacamole sounds amazing! I love the idea of grilling the ingredients.. genius! I need to try this.. thank you for sharing! Just hand me the bowl and a spoon! We just had some grilled corn guacamole at a restaurant recently and my husband declared we needed to try some at home. This looks like just the right recipe! What a beautiful post! This all looks so delicious! I would have never thought to grill the avocados! Loving this grilled guacamole!!! Happy fourth of July! 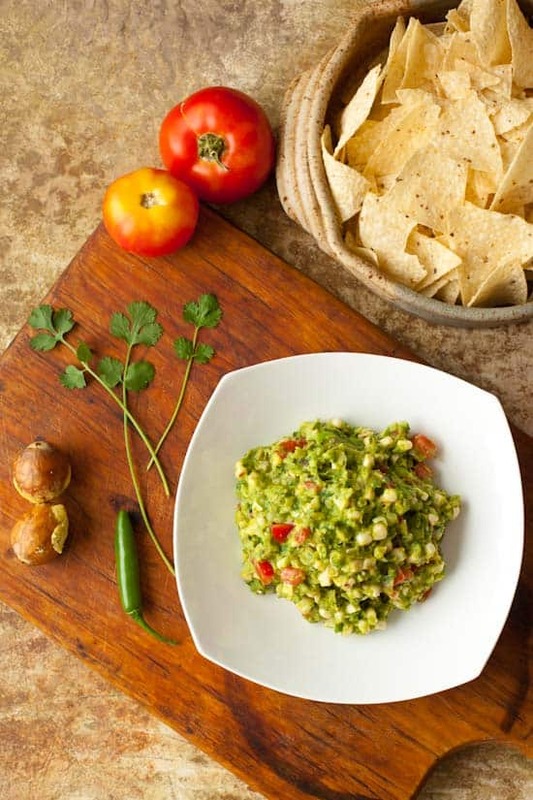 Love the idea of a smoky guacamole! I belong to a CSA too and can't wait until we get some corn. I can't wait to try this menu. I have longed for grilled corn and it's a pleasure that your site explains very well how it is prepared. Thanks for grilling it well! I am happy to have found your site through Google. Your recipes are well explained and easy to follow. You really will make good cooks of people reading your blog posts. I just want to show my gratitude. Thanks for sharing this wonderful food resource. Great post! Delicious dish with easy to find ingredients! I can't wait to try this. Would it taste different without the tomato? very very nice post, here is good info of good food thank you for sharing ! 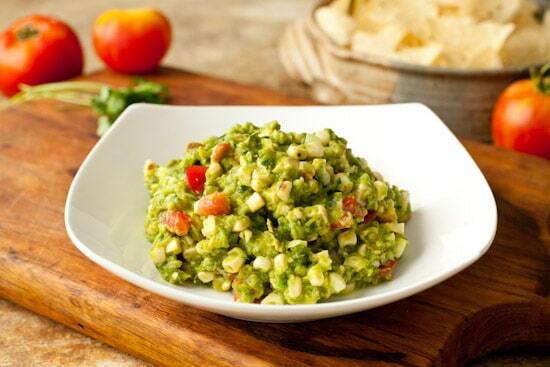 I love the corn in this guacamole. What a special recipe- can't wait to try this! Some Avacado Fun Facts: 1.Did you guys know that Hass avocado trees have been grown from grafted seedlings propagated from a single tree which was grown from a seed bought by Rudolph Hass in 1926? Cool! 2. They're fiber rich. 10 grams in a medium Avacado. 3. They lower bad cholesterol. They lower LDL. 4. They're an anti-aging powerhouse. The fountain of youth here.Eat up your Guacamole Dip with good conscious! Feeding is another getting hobby to the uk’s people who are always fond to choose the various test and various smell. The Foodhuntr, leading uk supplier of various testy food as Italian Pasta, Chicken Gravy with rice, flavored beef kebab etc with many more delicious food. No jam, no pressure just online order and get the accurate time to your order. Foodhuntr believe the satisfaction of the people. This is not only business but a great service to get always a new test with new adventure. Greetings! Very useful aadvice within this article!It's the little changrs that produce the most significant changes. Thanks a lot forr sharing! Hola , ? ?puesto aseado . No un asunto con su Página web en internet explorador, haría test esto? IE sigue sin embargo, es el mercado jefe y un gran elemento de gente omit maravilloso debido a este problema.